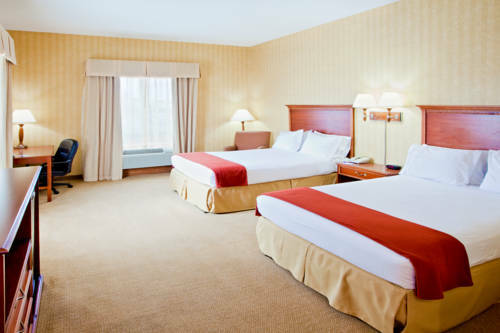 Stay Smart at Holiday Inn Express Woodbridge Hotel Located in Prince William County and just 23 miles from downtown Washington, DC, our Woodbridge hotel puts you in close proximity to area businesses and great attractions. Whether you are headed into the Washington, DC Metro area for business or vacation, we put you in the center of it all. Corporate travelers love our Woodbridge hotel because we provide them with the services and amenities they need most. We are proud to offer a Business Center featuring a computer with high-speed, wired and wireless Internet access, along with copy and print services. For guests who need to be close to Quantico Marine Base, Fort Belvoir, the FBI Academy or Amtrack Auto Train Lorton Station, we are just minutes away. For those guests who are on vacation, we have numerous options to entertain the entire family. With easy access to local attractions, such as Mount Vernon, Historic Occoquan, IKEA, AMC theaters and the Potomac Mills Outlet Mall, you will never be without something to do. Taking a day trip into Washington, DC offers you the opportunity to spend the day touring a Smithsonian museum, visiting the historic monuments, experiencing Arlington Cemetery or viewing wildlife at the National Zoo.When you are our hotel's guest in Woodbridge, VA, you can enjoy conveniences like an Indoor Pool, Fitness Center and a complimentary, Hot Breakfast Buffet along with a hospitable staff. Book your stay today. Potomac Mills Mall is a bargain hunter's mecca and features over 200 of the best names in retail. Old Hickory Golf Club in Woodbridge with pristine conditions and personal service, offers a true Country Club Experience. The par 72, 7131 yard championship layout is the work of architect Tim Freeland.